New Scottish screen talent was celebrated at the award ceremony in Glasgow last night which saw Sarah Miele take home the award for Female Acting Performance for her role in Grimm Street, in which she played a character with muscular dystrophy. The Acting Performance Male award was then clinched by 23-year-old Daniel Cameron for his role in I Am Me, in which he played a character with autism. The annual awards ceremony recognises, inspires and celebrates the diverse array of emerging practitioners from all over Scotland and gives up-and-coming screen talent an all-important platform to showcase their work to the wider sector. 36 nominees were selected across 12 categories, by juries made up of screen sector professionals, including animation, sound, design, production, entertainment and writer. In the writing category sponsored by Creative Scotland, Michal Wdowiak won for his comedy-drama short Yogi, a film he wrote for his final year at College. Wdowiak also picked up the Editor Award supported by Edit 123 for the short. 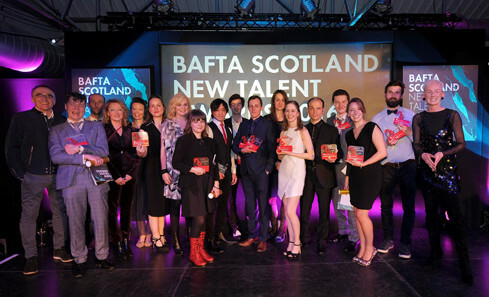 View the full list of winners on the BAFTA Scotland website. The British Academy of Film and Television Arts is an independent charity that supports, develops and promotes the art forms of the moving image by identifying and rewarding excellence, inspiring practitioners and benefiting the public. In addition to its Awards ceremonies, BAFTA has a year-round programme of learning events and initiatives – featuring workshops, masterclasses, scholarships, lectures and mentoring schemes – in the UK, USA and Asia; it offers unique access to the world’s most inspiring talent and connects with a global audience of all ages and backgrounds. BAFTA relies on income from membership subscriptions, individual donations, trusts, foundations and corporate partnerships to support its ongoing outreach work. To access the best creative minds in film, TV and games production, visit www.bafta.org/guru. For more, visit www.bafta.org.